Dr. A. K. Sikka, Dy. Director General (NRM) and Incharge Dy. 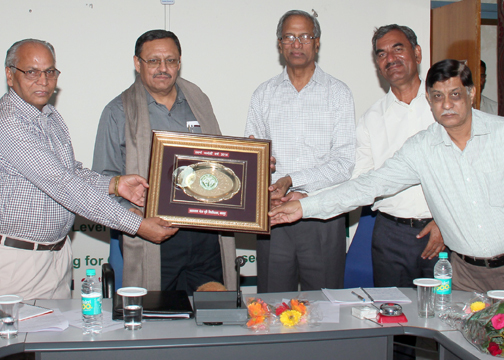 Director General (Extension) Indian Council of Agricultural Research, New Delhi, visited JNKVV Jabalpur on 21st and 22nd April 2014. Dr. Sikka visited the NRM projects of Department of Soil Science & Agril. Chemistry, Agronomy, College of Agriculture, and Soil and Water Engineering Department of College of Agricultural Engineering, JNKVV Jabalpur. He also visited Biotechnology Centre, Seed Technology Centre, IFS Modules, and Botanical & Herbal Garden of JNKVV, Jabalpur. 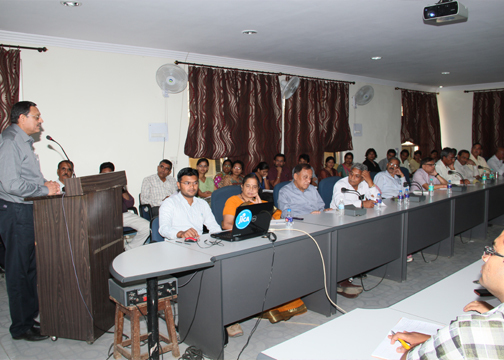 On 22 nd April, he delivered a Guest Lecture in the Seminar Hall of Directorate of Research Services, JNKVV Jabalpur. Hon’ble Vice Chancellor, JNKVV Prof. V. S. Tomar Chaired the Session. Dr. S. S. Tomar, Director Research Services welcome the Guest by presenting flower bouquet. 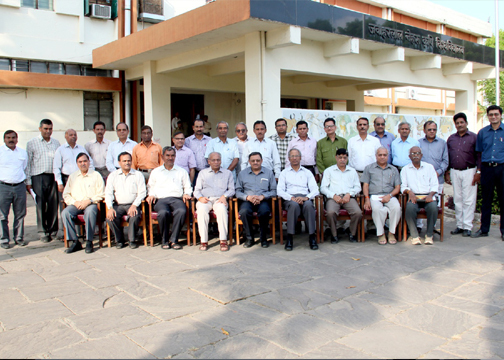 Dr. P. K. Mishra, Director Extension Services, Dr. A. R. Sharma, Director, Weed Science Research (ICAR), Dean, College of Agriculture, Jabalpur, Dean College of Agricultural Engineering, JNKVV Jabalpur, all Heads of Departments and Scientists were present in the meeting. Dr. A. K. Sikka, Dy. Director General (NRM) and Incharge Dy. Director General (Extension) Indian Council of Agricultural Research, New Delhi, delivering Guest Lecture at JNKVV, Jabalpur. Hon.ble Chief Secretary, Shri Anthony JC DeSa visited Zonal Agricultural Research Station, Powarkheda (Hoshangabad) on 16th February 2014. Hon’ble Vice Chancellor Prof. V.S. Tomar, Dean Faculty of Agriculture Dr. S. K. Rao, Director Research Services Dr. S. S. Tomar, JNKVV Jabalpur were present during the visit. Hon’ble Vice Chancellor welcome the Hon’ble Chief Secretary and narrated the research program of various research projects running at Zonal Agricultural Research Station, Powakheda viz. AICRP on Water Management Project, Wheat Research Project, Integrated Farming System, Oilseeds Research Project and Sugarcane Research Project. 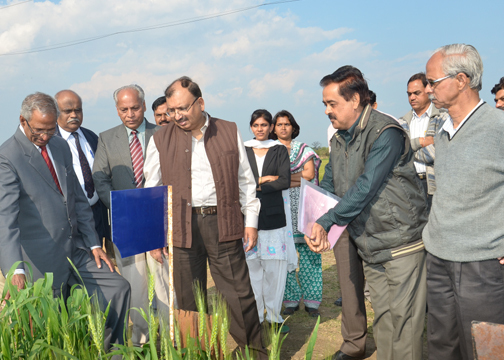 Hon.ble Chief Secretary overwhelmed to see the enormous variability in wheat germplasm planted. He shown keen interest in biodiversity conservation, gene deployment and morphological potential of varieties. He also visited Krishi Vigyan Kendra, Powarkheda and ;discussed about extension activities.Hon.ble Chief Secretary personally observed the process of hybridization in order to develop wheat varieties. He congratulated the Vishwa Vidyalaya authorities and scientists for the success. Hon’ble Vice Chancellor informed that JNKVV ranks first in the Country in seed production program and emphasized the need of Development of Model Wheat Research Center at Powarkheda. Chief Guest was convinced and assured to help in this regard. Hon.’ble Vice Chancellor, JNKVV, Jabalpur informing the research program and achievements of various research projects running at Zonal Agricultural Research Station, Powakheda to Hon.ble Chief Secretary, Shri Anthony JC DeSa during field visit. 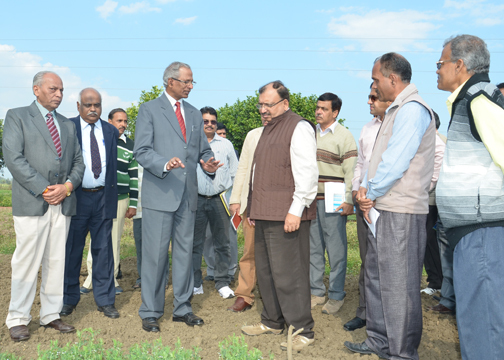 Hon.ble Chief Secretary, Shri Anthony JC DeSa visiting experimental fields. along with Hon.’ble Vice Chancellor, Dr. V. S. Tomar Director Research Services, Dr. S. S. tomar, Dean Faculty of Agriculture, Dr. S. K. Rao at Zonal Agricultural Research Station, Powarkheda (Hoshangabad) on 16th February 2014.